Today, early February, our apprentice Dean and I are off to one of our very local producer/suppliers, The Wooden Spoon. This is as local a producer as we get, as they are a mere 0.6 miles from us door to door. The company was first started in a kitchen, here in Wye and moved about 10 years ago to its location just outside of the village as it expanded its operations, it is a true Kent producer. As well as small independent business’ such as ours, they also have larger customers including such names as Fortnum and Masons. As we approached the small building via the lane in front of us we came upon the unassuming building with the sign showing us we had arrived. We were very warmly greeted by Grace our host for the visit. She shared with us the background story of The Wooden Spoon and took time out to show us the production, washing and packing room. I can’t move on with the tour at this point without mentioning how cute my partner in the tour looked in his blue hair net, I am just disappointed he would not let me take a photograph. We were able to chat with one of the two chefs that create all of the gorgeous Jams, pesto’s and relishes which was really insightful and helped us understand how the jams that we use here are made. The Wooden Spoon are now also creating fruit and liquor combos, we hope to have the peach and prosecco option for our customers to treat their mums this mother’s day so watch this space. After a browse around the shop looking and the variety of produce that they have we say our thank you’s and head off back to work. 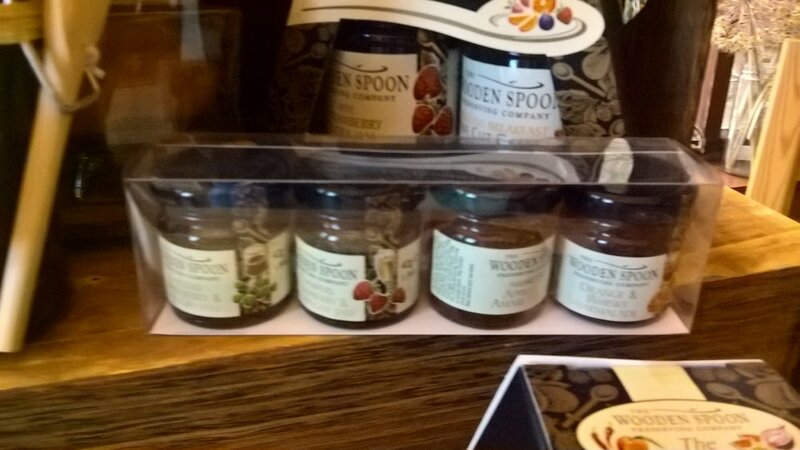 You can find The Wooden Spoon products used in some of our dishes and in our small shop area which is near the main street door entrance of our bar, they also attend the local farmers market here in Wye. Thank you to Grace and all of the team at Wooden spoon for taking care of us.